It’s oscillating, and it’s a tower ceramic heater. The Lasko 5790, therefore, gives you a wider heating coverage, and since it has a slim footprint, it should have no difficulty fitting into tight spaces. Let’s not forget that since it’s equipped with a ceramic heating element, it gives out a consistent heat output. But does it deliver these promises? Let’s answer that in this Lasko 5790 review by giving you a summary of consumer feedback. – Safety. 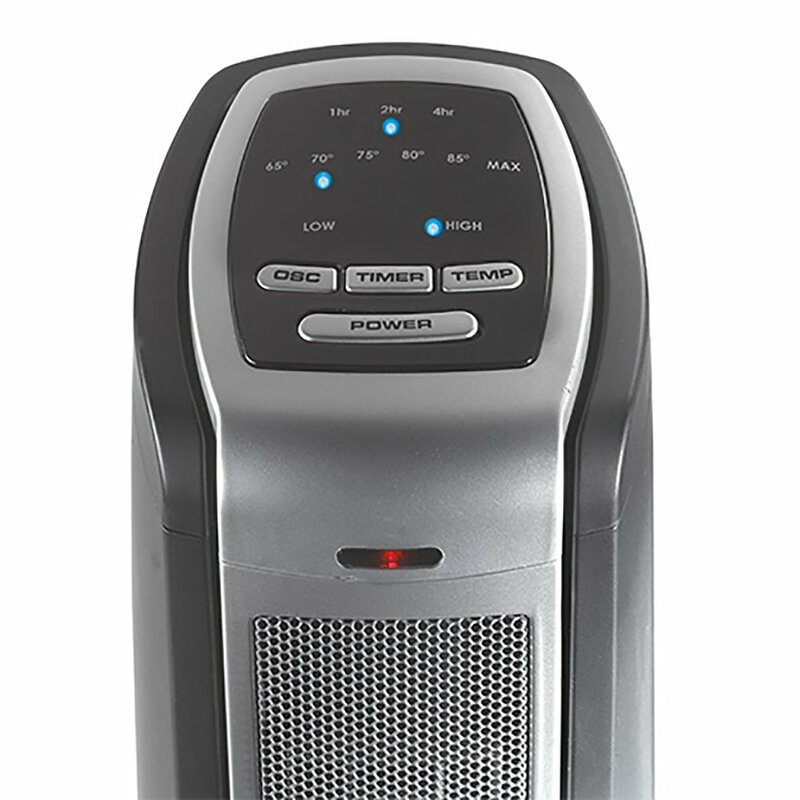 This Lasko tower heater is equipped with an overheat protection feature. The heating element is self-regulating. Plus, the exterior is considered a “cool-touch” surface so it doesn’t burn your skin. – Controls. The Lasko 5790 comes with electronic controls. They’re not touch controls, but they’re convenient to use. There are light indicators to show your preferences. Let’s not forget to say that this unit also comes with a remote control. – Features. Using either the controls on the unit or the remote control, you can make adjustment on the following: 3 quiet settings, 7-hour timer, and thermostat. See image on the right for your reference. – Size and Weight. This unit weighs 7.74 lbs. and it stands 22.55 inches. Its complete product measurements are 7.1″L x 7.74″W x 22.55″H. – Coverage Area. 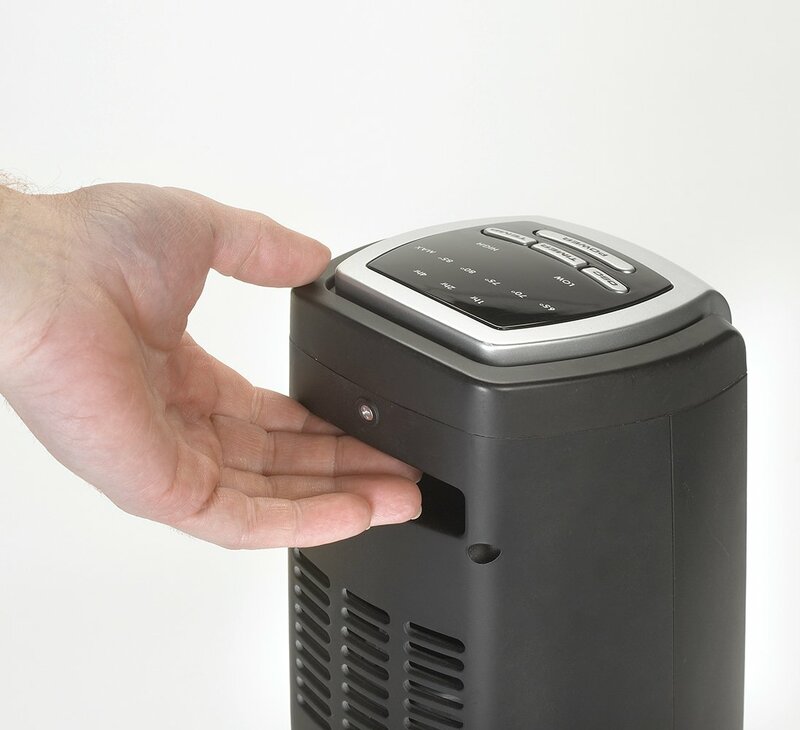 According to feedback, this tower heater can effectively heat medium-sized rooms well. Apparently, depending on the conditions, it can also be reliable on large spaces. For instance, one person shares that the Lasko 5790 heats up his 1000-square feet condo nicely. Another person said this heater warms up their basement room very well. If you’re wondering if this can be used in the bathroom, the manufacturers say that it’s not recommended for use in bathrooms. – Noise. True to its ceramic nature, this tower heater is quiet. If there’s some noise it produces, it’t not obtrusive. – Limitations. It has an automatic shut-off feature when the timer runs out. However, it doesn’t turn itself off automatically when it’s accidentally knocked over. Two, you may find the power cord to be small. Three, there are complaints about this tower fan’s quality. Some say that their unit stopped working after only a few months. Also Read: Honeywell HCE322V Review: Is It Any Good? When it works, the Lasko 5790 is a reliable supplemental heater. For instance, you can rely on it when your son’s room doesn’t receive much heat from your central heating system. It performs best in small- to medium-sized rooms. It’s easy to use, and the features it has are truly useful.